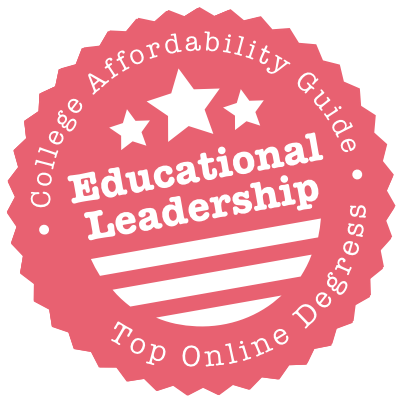 Scroll down to see the top not-for-profit colleges offering educational leadership degrees online. Baylor's online EdD prepares educators and development professionals to apply essential learning principles toward managing the dynamics of organizational change. Complete in three years. Earn an Ed.D. in leadership and learning in organizations online from Vanderbilt University's top-ranked Peabody College. The program empowers influential leaders to address systemic challenges and drive positive change within the workplace. A master's degree is required to apply. Arkansas State University offers an online Educational Specialist in Educational Leadership degree with five areas of emphasis: superintendency, principalship, special education, curriculum director, and gifted and talented director. There is also an online Master of Science in Education in Educational Leadership degree available. The 36-credit program can be completed in just 20 months. The curriculum includes coursework in diverse topics in educational leadership today such as ethical leadership, school law, school and community relations, curriculum management, and supervision and evaluation of teaching. Non-resident students seeking an Arkansas teaching license are required to enroll in the Seminar in Arkansas Studies course. A certificate in educational leadership is available for state-credentialed educators who wish to qualify for the Building-Level Administrator license (principal's license). Ball State University offers a Master of Arts in Education (MAE) degree with a concentration in educational administration that can be completed entirely online. The program prepares students for a K-12 administration and supervision license in Indiana. Students typically earn their MAE degree in 18-20 months. The 36-credit program includes coursework in topics such as school law, supervision of instruction, educational finance and ethics, human resource development, and educational decision making. The university also offers a Doctor of Education (Ed.D.) in Educational Administration and Supervision degree that is available partly online. The program fulfills the licensing requirements for school superintendent in Indiana. The Ed.D. degree consists of 90 semester hours, 48 of which must be completed satisfactorily at Ball State University. An online Master of Education (M.Ed.) in Educational Leadership degree with a concentration in educational studies is offered online by the California University of Pennsylvania. The curriculum includes coursework in instructional design, current technologies in education, and inclusive classroom strategy. There is also an online M.Ed. Administrative Program for Principals that fulfills the academic requirements for K-12 school principal certification in Pennsylvania. The program is comprised of 30 graduate-level credits. Applicants who already have a related master's degree in education can complete only the school principal certification requirements, which consists of 24 credits. The M.Ed. Administrative Program for Principals follows a cohort model of education and includes coursework in curriculum leadership, school law and ethics, instructional strategies, and school community relations. Canisius College offers a Master of Science in Educational Leadership and Supervision degree that can be pursued entirely online. The program is accredited by the Council for the Accreditation of Educator Preparation (CAEP). Applicants must already hold a valid teacher certification to be considered for admission to the MS program. Students have the option of selecting one of the following areas of concentration: emerging issues in educational leadership, educational technologies and emerging media, athletics administration, and instructional leadership. The curriculum includes coursework in school law, supervision for the improvement of instruction, school personnel administration, and instructional program design. Students must complete a minimum of 35 credits and an education administration internship experience in order to graduate from the program. The Doctor of Education (Ed.D.) in Educational Leadership program at Central Michigan University is offered predominantly online. Students are required to attend only four face-to-face meetings during summer at pre-set dates determined a year in advance. The program consists of 63 credits and has TEAC (Teacher Education Accreditation Council) accreditation. There are currently four areas of concentration available: K-12 leadership, higher education leadership, K-12 curriculum, and educational technology. The university also offers a Master of Arts in Educational Leadership degree that can be completed online. The program is comprised of 30 credits and has the following areas of emphasis: charter school leadership, rural education leadership, supervision, and virtual education leadership. Completion of the degree qualifies students for the Michigan Administrator Certificate. Colorado State University offers a Doctor of Philosophy in Education and Human Resource Studies degree with a specialization in higher education leadership that can be completed partially online. Students are required to attend an on-campus orientation. The program consists of 60 credits, of which 50 percent must come from the higher education administrative curriculum and 50 percent from research coursework. The degree can be earned in five years. The university also offers a fully online Master of Science degree in student affairs in higher education. The 45-credit program can be completed in three years. The curriculum includes courses such as the following: Ethical and Practical Issues in Student Affairs, College Opportunity Program Models, and Trends, Issues, and Assessment in Higher Education. Students admitted to the Doctor of Education (Ed.D.) in Educational Leadership program at Concordia University Chicago have the option of earning the degree online or on campus. The program consists of 61-67 credits and offers a researcher track and a practitioner track. Students are prepared for district-wide leadership and administrative responsibilities in public or private educational settings. The curriculum includes the required core courses for the educational leadership specialization, as well as foundations/philosophy coursework and classes in research and statistics specifically designed for each track of study. The courses required for the Superintendent Endorsement of the State of Illinois are included in the curriculum. Students must complete an internship experience, pass a comprehensive exam, and write a dissertation in order to graduate. Educators who want to develop their leadership skills can earn an online Master of Arts in Education in Educational Administration or a Doctor of Education in Educational Leadership through Corcordia University Irvine. The Ed.D. program uses a blended approach that includes eight-week sessions with one face-to-face learning session on campus in Irvine each term. Students must be online for synchronous sessions three times per term, with the rest of the coursework delivered asynchronously. Students can complete the doctoral degree in about three years. The master's program is delivered fully online with a mix of synchronous and asynchronous elements. Both programs use a cohort format that allows students to form a network of peers. The online Master of Education in Educational Leadership degree at Concordia University Portland is designed for experienced education leaders in both K-12 and higher education fields. The program equips students with the skills to design, implement, and assess school-based instructional initiatives in a variety of educational settings. Students must complete 27 credits from the educational leadership core, which includes coursework in contemporary educational thought, school and community partnerships, and educational research. Most classes are five weeks in length. The completion of one of the following is required for the degree: action research, thesis, or practitioner inquiry. Although the M.Ed. program does not lead to state certification or licensure, completed coursework may be applied towards the renewal of a teaching license. Students accepted to the Master of Arts in Education program with a concentration in educational leadership at Concordia University St. Paul have the option of earning the degree online. Each course included in the 30-credit program is seven weeks in length. Students complete one three-credit course every seven weeks, allowing them to graduate from the program in two years. Although there are no face-to-face meetings required, online students must attend a one-hour synchronous audio-visual chat every week. The MA program follows a cohort model of education. Students enroll in a pre-determined course sequence that includes courses in the following: Supervision and Improvement of Instruction, Educational Research and Applications, Legal and Ethical Issues in Education, and Human Resources and Diversity. Concordia University offers a Master of Science in Education Leadership degree that can be pursued online. The program prepares students for administrative and leadership roles in the educational field by offering a comprehensive curriculum. Students acquire the skills and knowledge needed for personnel and resource development, sustaining a positive learning environment, fund raising, and implementing and evaluating school policies. The program is comprised of 32 credits and includes coursework that cover topics such as professional learning communities in a pluralistic society, curriculum development and instructional supervision, organizational theory in educational settings, and current issues and emerging trends in principalship. The online MS program is available through Concordia University in Ann Arbor, therefore, the curriculum is aligned with Michigan state standards. Educators who want to become principals or teacher leaders can earn an online Master of Science in Educational Leadership from Creighton University. Students choose a specialty in school administration or teacher leadership and further customize the program by indicating their preference for public school or Catholic school training. This is a 36-credit program that includes project-based learning and an internship so students gain hands-on experience. Candidates can complete the program in two years. Administration majors who want dual endorsement in elementary and secondary education must take additional credits. Applicants must have at least two years teaching experience and a 3.0 GPA on undergraduate work. This program offers a reduced tuition rate and several scholarships. Drexel University offers an online Doctor of Education in Educational Leadership and Management degree that follows a cohort model of education. Students can complete the 60-credit program in three years following a part-time plan of study. There are nine areas of concentration currently available: special education leadership, learning techniques, human resource development, higher education, global and international education, creativity and innovation, educational administration, athletic administration, and educational policy. The concentration in educational administration is offered with Pennsylvania Superintendent Certification. Drexel also offers a Master of Science in Educational Administration degree that can be pursued with our without principal certification. Although the program is available online, students must attend two orientation sessions, leadership seminars, and several campus events each year. The Master of Arts (MA) in Educational Leadership, K-12 Administration degree offered at Eastern Michigan University can be completed online. The program has been approved by the state to offer a roster of courses that meet the academic requirements for the building level principal license in Michigan. Students work with their advisors to craft an individualized plan of study that culminates in the MA degree as well the administrative certification. The program consists of 35 graduate credit hours, 29 of which must come from basic concentration courses and 6 from supportive coursework. Some of the basic concentration courses include the following: Educational Leadership in a Pluralistic Society, Leadership for School Improvement, and Legal, Ethical, and Professional Issues of Administration. Edinboro University offers a Master of Education (M.Ed.) in Educational Leadership degree that can be completed online. The program is made up of 30 credits or 10 graduate-level courses and prepares students for leadership and administrative roles on the classroom, school, and district levels. Students enroll in classes that cover essential topics in the educational leadership field today, such as technology standards for educational leaders, school and community relations, instructional leadership, and dynamics and processes of change. The M.Ed. program fulfills the academic requirements for K-12 Principal Certification in Pennsylvania, as well as for the Superintendent's Letter of Eligibility. Students must satisfactorily complete a comprehensive examination in the final semester of the program in order to earn the degree. The fully online Educational Specialist (Ed.S.) degree at Gardner-Webb University is a 42-credit program that can be completed in six semesters. Applicants must hold a master's degree from an accredited university and have a minimum of three years of administrative experience. The completion of a final project is a requirement for the degree, as well as for North Carolina licensure. A Doctor of Education (Ed.D.) in Educational Leadership is also available online. Applicants must have the same qualifications required for the Ed.S. program, in addition to holding a valid School Administration-Principal license. The Ed.D. program consists of 63 credits. The university offers an Add-On Licensure for Executive Leadership certificate that consists of 24 credits and can be completed in five semesters. George Mason University offers a Master of Education (M.Ed.) degree in educational leadership that can be pursued completely online. The program is accredited by the National Council for Accreditation of Teacher Education (NCATE). The 30-credit degree is comprised of 24 credits of educational leadership courses and 6 credits of general M.Ed. coursework. Students proceed through the program as a cohort and follow a pre-determined sequence of classes. The M.Ed. program offers a concentration in Mathematics Specialist Leader (K-8) that can be pursued partially online (50 percent). Students who complete the program are eligible to apply for state licensure as a K-8 mathematics specialist in the State of Virginia. The university also offers a fully online 24-credit Graduate Certificate in Educational Leadership. George Washington University offers an online Education Specialist (Ed.S.) in Educational Leadership and Administration degree that is accredited by the National Council for Accreditation of Teacher Education (NCATE). The program is comprised of 30 credit hours and designed for working education professionals with master's degrees. A Graduate Certificate in Educational Leader and Administration program is also available online and can be completed in just one year. Students who earn the certificate fulfill the educational requirements for the principal or administrator licensure in the District of Columbia. The program includes two internship opportunities, both of which must be completed in order to graduate from the program. The university also offers an online Master of Arts in Educational Leadership and Administration degree. Georgia Southern University has a Master of Education in Educational Leadership that prepares individuals for an entry-level leadership position in a P-12 school. This is a 36-credit program that includes a leadership professional core, teacher-leader core, and supervised field experience. Some 250 hours of clinical practice and field experience are embedded in the program and will be supervised by GSU and the candidate's school or district partner. All classwork for this program is online. Applicants must hold a professional level 4 or higher certificate in a teacher, service, or leadership field and have a GPA of 2.75 or higher on combined undergraduate and graduate work. GRE or MAT scores are required. The Education Specialist (Ed.S.) degree at Jacksonville State University is a 30-hour program that can be completed online. The Ed.S. program of study leads to a Class AA Instructional Leadership Certificate in addition to the specialist degree. Applicants must already have a Master of Science in Education (MSE) degree or certification in instructional leadership to be considered for admission. Students enroll in a total of 10 classes, which cover topics such as measurement and evaluation in education, curriculum development, planning and managing facilities and programs, and personnel development. The university offers an MSE in Instructional Leadership degree that can also be pursued online. This is a 36-credit degree that leads to the MSE degree and a Class A Instructional Leadership Certificate. Students accepted to the Master of Education (Ed.D.) in Educational Leadership program at Lamar University have the option of completing the program entirely online or through a combination of online and on-campus courses. Online classes follow five-week schedules with a week off between classes. On-campus classes for the hybrid option take place one weekend each month during the fall and spring semesters, and two weekends each month during the summer term. The online and hybrid Ed.D. programs can each be completed in eight semesters and begin in the spring semester. Applicants must have professional experience in the field of educational leadership to be considered for admission. Acceptable work backgrounds can be P-16 schools, community-based organizations, or human services agencies. There are two graduate-level programs in educational leadership that are currently offered online at Liberty University - Education Specialist (Ed.S) and Doctor of Education (Ed.D). The Ed.S. program consists of 30 credits, 24 of which must be earned at Liberty University. There is no residency requirement for students pursuing the non-licensure program. In addition to the 15-credit educational leadership cognate, students must complete core courses in the foundations of education (9 credits) and research and evaluation (6 credits). The completion of a capstone course in the final semester is a requirement for graduation. The Ed.D. program is comprised of 60 credits and includes coursework in organizational analysis and problem solving for educators, culture and educational leadership, college and university administration, and conflict resolution. Educators can earn advanced degrees in educational leadership at two levels through online coursework provided by Marshall University. The online Ed.D. in Leadership Studies is a 45-credit program that requires students to come to campus one time, when they defend their dissertation. Students can concentrate in public school administration, higher eduatioin administration, or community college administration. Most students complete the program in about four years. The Master of Arts in Leadership Studies program offers an online emphasis in educational leadership (school principal), that is a 36-credit, portfolio-based program. McKendree University offers an online Master of Arts in Education degree with a concentration in higher education administrative services. The program consists of 36 credits made up of 12 three-credit courses. All courses are eight weeks in length. Students can earn the degree in two years by taking one course every eight-week session. The program can be completed in 14 months if students opt to follow an accelerated pace by taking two courses each eight-week session. The curriculum includes coursework in areas such as student development and services in the modern campus, strategies of financial management, issues in student access, and power and influence in higher education. Students are required to complete a capstone group project to graduate from the program. The fully online Master of Arts (MA) in Educational Leadership degree at Montclair State University is a 36-credit hour program that can be completed in two years. Each course is eight weeks in length and offered asynchronously. Students can select the fast track option that allows them to earn the MA degree in addition to principal and supervisor certifications in 14 months. This option combines online and hybrid classes and follows a cohort model of education. The curriculum includes coursework in differentiated supervision, effective leadership in a diverse society, and education law. Students who plan to apply for the New Jersey principal and superintendent certification upon graduation must complete the following two courses - Internship in School Leadership and Fieldwork in District Leadership. The Sanford College of Education at National University offers a Master of Science in Higher Education degree that can be pursued online. Students must complete at least 45 quarter hours (10 courses) in order to earn the degree. The curriculum includes coursework in topics such as student services and enrollment management, higher education research, policy and accountability, community development in higher education, and strategic planning and analysis. A thesis is required to graduate from the program. The university also offers an online Master of Science in Educational Administration program. Students can complete the program with or without a preliminary credential option in administrative services. The program also consists of 10 courses and includes coursework in curriculum leadership, instructional leadership, and organizational/systems leadership. The Master of School Administration (MSA) degree at North Carolina State University is an online program that is open only to North Carolina educators. Applicants must be employed in a K-12 school in the state and have three years of professional teaching experience. The program consists of 42 graduate-level credits, 24 of which come from the completion of eight three-credit courses, with the remaining 18 credits coming from a one year full-time, building-level internship. The MSA program leads to principalship licensure. The curriculum includes coursework in school-based budgeting, ethics in educational decision making, school law, and principles of educational administration. There is also a Doctor of Education in Adult and Community College Education degree that combines face-to-face instruction with online classes. Northern Arizona University offers an online Master of Education (M.Ed.) in Educational Leadership degree that is accredited by the National Council for Accreditation of Teacher Education (NCATE). There are three emphasis areas currently available: school leadership, principal K-12, and community college and higher education. Students who complete the principal K-12 program will be recommended for state certification as a K-12 principal. All the required courses for the community college and higher education program are available asynchronously and there are multiple start dates for the program throughout the year. The school leadership degree prepares students without building or district certification for K-12 educational leadership positions. All work for the M.Ed. degree must be completed within six years of a student's initial matriculation. The Fischler College of Education at Nova Southeastern University offers an Educational Specialist (Ed.S.) degree in educational leadership that can be pursued online. The 36-credit program includes coursework in topics such as ethical school leadership, technology for educational leaders, standards-based curriculum and assessment, organizational management of schools, and educational budgeting and finance. The university also offers an online Master of Science in Education (M.S.Ed.) degree with a specialization in educational leadership. Both programs are approved in Florida to provide add-on certifications for licensed teachers and to offer courses that are aligned with the educational leadership requirements of the Florida Department of Education. Degree candidates must complete an administrative internship for a minimum of 300 contact hours under the supervision of an administrator. PennState World Campus has an online Master of Education in Educational Leadership with three areas of emphasis: Teacher leader, school leader, and school leader without principal certification. Educators can continue teaching while pursuing the teacher leader degree. Those seeking principal certification perform a yearlong internship where they are supervised by an onsite mentor principal. This option is only available to educators with Pennsylvania certification. The school leader without certification is for students who work in private or international schools. PennState also has an online Graduate Certificate for Principalship open to Pennsylvania-certified educators. U.S. News ranked PennState's educational leadership program as No. 9 in the 2018 list of Best Colleges. The School of Education and Social Science at St. Leo University offers a Master of Education in Educational Leadership degree that can be completed entirely online. Applicants must hold Florida K-12 teacher certification and be able to fulfill the practicum requirement within the state. The program is approved by the Florida Department of Education and maintains a roster of coursework that reflects the eight major content areas of the Florida Educational Leadership core curriculum. Students must satisfactorily complete 36 credits to earn the M.Ed. degree, which includes an educational leadership practicum course. The curriculum includes coursework in school management, values and ethics in school leadership, curriculum for special populations, data driven instructional decisions, and building school and community relations. Southwestern Oklahoma State University has a Master of Education (M.Ed.) in Educational Administration degree that can be pursued online. Courses are delivered synchronously via webinars. Students and instructors meet at a pre-determined time online at least once a week, providing ample opportunity for discussion and instruction. Applicants are required to have at least two years of professional classroom teaching experience and hold a valid Oklahoma teaching certificate to be considered for admission. The program is comprised of 36 credits and includes coursework in the following: fundamentals of curriculum planning, educational leadership psychology, supervision of instruction, public school finance, and school personnel administration. Students must complete a graduate capstone experience during their final semester in order to graduate from the program. The Master of Arts in Higher Education Administration degree at Stony Brook University is available entirely online. The program consists of 36 credits, 15 credits of which must be taken from the core requirements for the degree. Students can take the remaining 21 credits from a cluster of electives that support their academic and professional goals. The university also offers an 18-credit Advanced Graduate Certificate in Higher Education Administration entirely online. The following courses are required for the certificate: Foundations of Higher Education Administration, Survey of College Student Development Theory, Leadership in Higher Education, and Assessment and Evaluation in Higher Education. There is a post-master's certification program available online that prepares students for certification at the school district and school building levels. Texas A & M University Commerce offers a fully online Master of Education in Educational Administration degree with an option for principal certification. The 30-credit hour program includes coursework in the following: leading effective schools, using evaluation and data to improve learning, and facilitating learning for diverse student populations. The university also offers an online Doctor of Education (Ed.D.) degree in educational administration. The program has an emphasis in K-12 public school administration and follows a cohort model of education. The Ed.D. in Higher Education Leadership program is offered 50 percent online and consists of 90 semester hours. Students are required to have a minor comprised of 30 semester hours in a field outside their major field of study. The University of Scranton offers an online Master of Science in Educational Administration degree that can be completed in as little as 18 months. Students enroll in 13 classes that make up a total of 39 credit hours. The credit hours are broken down as follows: 24 credits from the educational administration core, 12 credits from the foundation course requirements, and a 3-credit research course. The curriculum includes coursework in school finance, literacy and diversity, principles and practices of supervision, and curriculum theory and development. Students must complete two 150-hour practicums - one in an elementary school setting and another in a secondary school environment. Students have the option of requesting a faculty site visit to verify their practicum performance. The Master of Education (M.Ed.) in Educational Leadership and Policy Studies degree at the University of Texas Arlington is available online and can be completed in 18 months. This is a non-thesis principal certification program that follows the standards established by the Educational Leadership Constituent Council (ELCC). Students must complete 36 credit hours that includes a capstone internship that fulfills the comprehensive examination requirements of the degree. The curriculum includes coursework in educational governance, political and legal aspects of education, curriculum design, implementation, and evaluation, principalship, and resource management in education. The M.Ed. curriculum fulfills the educational requirements of the Standard Texas Principal Certificate. The university's education programs are accredited by the National Council for Accreditation of Teacher Education (NCATE). The University of Texas Tyler offers a Master of Education in Educational Administration degree that can be completed online. The program has a principal certification concentration and accepts Texas residents only. Applicants must be a state-certified teacher, with professional teaching experience in a public, private, or charter Pk-12 school environment. The 30-credit hour curriculum is structured along four study blocks: introduction to educational administration, curriculum and instruction, special populations and functions, and the principalship. The program does not require students to write a thesis in order to earn the degree. Instead, students develop a research project at the beginning of the program, which they conduct in their own school. The culminating experience is a written research report summarizing their findings. The online Master of Education in Educational Leadership Certification degree available at the University of West Florida is comprised of 33 credits and can be completed in 18 months. There are six start dates available each year. The program covers the 10 Florida Principal Leadership Standards and related competencies. Applicants without current professional teacher certification in Florida must meet additional requirements in order to be admitted to the program. Students who complete the program are qualified to take the Florida Educational Leadership Exam (FELE). The curriculum includes coursework on human relations and communication in education, curriculum development, and school improvement theory and practice. Each course is eight weeks in length, except for the course on principalship, which is 16 weeks long. Students accepted to the Master of Education (M.Ed.) in Educational Leadership program available at the University of Cincinnati are not required to make any on-campus visits since the degree can be pursued entirely online. The program consists of 30 graduate-level credits and can be earned in five semesters (21 months). Each course is about 14 weeks in length and students typically enroll in two courses per semester. The curriculum includes a course in Principal Clinical Internship, as well as coursework in the following areas: leadership for social justice, human resources administration in education, school and community partnerships, and curriculum development and data analysis. Students who complete the program and are seeking Ohio principal licensure must pass a Praxis Series Exam. Because students are regularly asked to come to campus, CU Denver's EdD in Leadership for Educational Equity is best-suited for Coloradans. The program admits professionals with at least five years of educational leadership experience, whether in a K-12 or higher education setting. As the degree title suggests, the curriculum emphasizes social justice and access, delving into the historical and social contexts of education systems so students can explore how best to transform them. The 54-credit program's cohort model helps students to create a network. They'll stick with their peers through 10 required courses, only branching off at the end to complete a dissertation. The University of Nebraska Lincoln offers an online Master of Arts in Education Administration degree with a concentration in higher education administration. Students accepted to the program follow a pre-determined schedule of courses on topics such as law and higher education, administrative theory, higher education environments, and foundations of research and methods of inquiry in higher education administration. The degree consists of 36 credits and has a non-thesis option. There are two doctoral degrees in educational administration available online - Doctor of Philosophy (Ph.D.) and Doctor of Education (Ed.D.). The Ph.D. program follows a hybrid or blended delivery system, while the Ed.D. degree can be completed entirely online. Online classes follow the regular semester and summer session schedule of the university. The Master of Science in Education (MSEd) degree offered at the University of New England is available 100 percent online and can be completed in just under two years. Students accepted to the program can choose educational leadership as their area of concentration. The 30-credit program is comprised of five core courses from the general curriculum and five electives from the student's area of concentration. The educational leadership courses are aligned with the national standards established by the Professional Standards for Educational Leaders (formerly the ISLLC). There is also a fully online Doctor of Education (Ed.D) in Educational Leadership degree available. The program can be completed in three years and follows the cohort model of education. Two cohorts are admitted each year. The University of North Carolina Greensboro offers a Specialist in Education in Educational Leadership degree that follows a hybrid delivery system. The program is comprised of 33 semester hours and meets the educational requirements of the North Carolina Level II (Advanced Principal) and Superintendent Licensure. Applicants must have a Master of School Administrator degree or principal licensure. The curriculum consists of coursework in four major areas: administration and leadership (21 hours), curricular and instructional leadership (3-6 hours), school and cultural foundations (3-6 hours), and research (3 hours). The university offers a Post Master's Certificate in Urban School Leadership and Administration program that is available entirely online. Students must complete 27 credits hours and a field-based practicum experience to earn the degree. University of North Texas ranked in the top 20 on U.S. News and World Report's 2017 list of best online graduate education programs. UNT's offerings include the Accelerated MEd in Educational Leadership, a 30-credit program with five start dates. Students take 10 required courses, all of which are 8 to 10 weeks long; they range from overviews of law and public relations to a practicum involving action research. The university recommends enrolling in up to two courses at a time. MEd students can also qualify for the 21-credit Accelerated Texas Principal Certification. Six of the prep program's seven courses overlap with the MEd. The seventh is a semester-long internship in a Texas school. The University of Northern Colorado offers an online principal licensure program that allows students to simultaneously work towards a Master of Arts (MA) or an Educational Specialist (EdS) degree in educational leadership. The program consists of at least 27 semester hours. Students with a Colorado principal's license can apply for admission to the online Administrator Licensure: District Level Leadership program. The degree requires an additional 15 semester hours beyond the principal licensure program. The administrator licensure can be pursued at the same time as an EdS or EdD (Doctor of Education) degree. There is an online Educational Leadership and Special Education Administration: Dual Licensure Degree program that leads to principal licensure, an MA or EdS degree, and a special education director license. The online Master of Science in Education/Educational Leadership program offered at the University of St. Francis has two areas of concentration: principal preparation (36 credits, leading to P-12 Principal Endorsement) and teacher leader (30 credits, leading to Teacher Leader Endorsement). Both programs follow a cohort model of education. All students must complete the required core courses common to both programs before enrolling in classes in their selected area of emphasis. There is a Doctor of Education/Educational Leadership degree that is available partially online. There are two concentration areas: stewardship, leadership, and learning, and superintendent certification. The available courses for both programs are based on the standards established by the Educational Leadership Constituent Council (ELCC) and the Interstate School Leaders Licensure Consortium (ISLLC). University of St. Thomas's MEd program comes in two varieties: online and hybrid. Both feature specialties in Educational Leadership. Applicants need a 3.0 from a bachelor's program to get admitted but not a GRE (unless their GPA was below 3.0). Once in, they'll take 36 credits of coursework topped off with a research project. Students will also be required to complete two 15-week internships focused on community and operations, respectively. Before graduating, they must compile two years of teaching-related experience, if they did not fulfill this requirement prior to matriculating. The University of the Cumberlands offers a fully online Doctorate of Education (Ed.D.) in Educational Leadership degree that can be completed in less than three years. The 60-credit program consists of 27 credits of administrative leadership coursework, 18 credits in the student's area of specialization, and 15 credits of professional research courses. There are currently six fields of specialization available: business, education, English, history, mathematics, and psychology. The university also offers an online Doctor of Philosophy (Ph.D.) in Leadership program. The program includes courses in curriculum and culture, professional research, and administration. Students have the option of selecting an area of concentration from the following: student personnel, religion, psychology, mathematics, information security systems, history, health sciences, English, education, criminal justice, and business. The online Education Specialist (Ed.S.) in Instructional Leadership at the University of West Alabama is designed for students with a current Class A Professional Leadership or Educator Certificate in Instructional Leadership. Applicants with Class A leadership designations (as instructional leader, principal, superintendent, etc.) may also be considered for admission. Students complete a minimum of 30 credit hours to earn the degree, 12 credit hours of which must be comprised of professional courses with the remaining 18 credit hours consisting of instructional support coursework. The curriculum includes courses on school reform models in elementary schools, innovative practices in a P-12 setting, and advanced educational research. There is also a Master of Education in Instructional Leadership program that leads to Alabama Class A certification. The online Master of Science in Administrative Leadership degree offered by the University of Wisconsin Milwaukee has three areas of concentration: adult and continuing education leadership, educational administration and supervision, and higher education administration. Students in the adult and continuing educational leadership program can focus on human resource and workforce development or instructional design, educational technology, and online support services. The educational administration and supervision option offers a program of study that leads to the MS degree and/or principal and director of instruction dual licensure. This is a fully online, two-year course of study designed for working licensed teachers. The higher education administration program includes coursework in topics such as college student personnel administration and strategic planning and budgeting in adult education. The online Master of Science degree in educational leadership at Western Governors University adheres to a competency-based learning model that allows students to advance in the program on the basis of their existing skills and knowledge. The curriculum is based on the standards of the Interstate School Leaders Licensure Consortium and the principles of the Baldridge National Quality Program's Education Criteria for Performance Excellence. Courses are measured in terms of competency units (CU), which is the university's equivalent of the credit hour. Students must enroll in a total of 40 CUs to earn the degree. The program is designed to be completed in four six-month terms. The completion of an integrated practicum and capstone experience is a requirement for graduation. William Carey University fell just outside the 90th percentile of the U.S. News rankings of Best Online Graduate Education Programs in 2017, and its doctoral programs build from that pedigree. The Ed.D in Educational Leadership comes in two parts. The first is a 30-credit Specialist in Instructional Leadership program for current M.Ed holders. That requires five core courses on instruction, as well as a field project and a professional writing course. The remaining two courses come from one of two concentrations: leadership or assessment. On its own, the program qualifies those who finish for a AAA teacher certification in Mississippi. The remaining 33 hours of the Educational Leadership degree combines research courses and advanced leadership classes.